Product totals 260g (4 pieces). 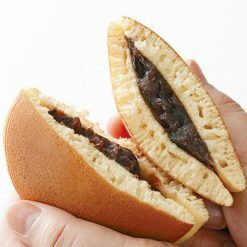 This homemade medium- ground red bean paste sandwiched between two pancakes has just enough sweetness, with texture and flavor. The red bean paste is prepared by boiling, mashing and grinding adzuki beans. Adzuki beans are usually a dark red color, due to the husk of the adzuki beans. Aduzki red bean paste is a staple in Japanese confectionary and sweets. The medium-ground red bean paste is made by boiling whole red beans with sugar. 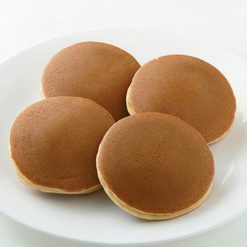 The pancakes are made in the same style as Japanese sponge cake, or castella, made of flour, sugar, eggs and starch syrup. The word ‘dora’ means ‘gong’ in Japanese. Due to the shape of the pancakes resembling gongs, this little cake came to be known as ‘dorayaki’, literally ‘gong bake’. In popular culture, the famous Japanese manga and anime character Doraemon, loves dorayaki (hence the character’s namesake). Thaw at room temperature for about 2 hours before serving. 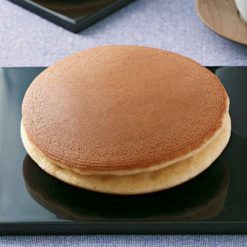 This product contains [Batter / pancakes] sugar, flour, eggs, cream, honey, sake, glucose, sodium bicarbonate [Bean paste] sugar, red beans (Hokkaido), salt, agar (some may contain wheat, eggs, milk component).